I realized I hadn't done a water marble manicure in quite a long time - I have had some failed attempts, but that of course does not count. I was trying to decide what colors to use when I was struck with the idea to do a holographic water marble! For this water marble manicure, I started off with three coats of China Glaze OMG! silver holo as a base. 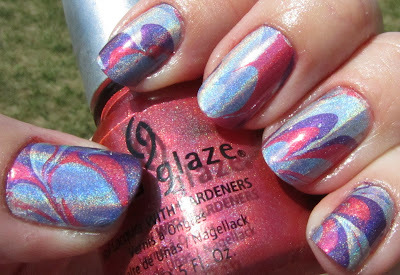 I then swirled China Glaze OMG, TMI, LOL, and 2NITE for the water marble effect and ta-da! Holographic water marble. Close up of thumb detail - my favorite nail! The thumb was my favorite on this one. The last couple of times I water marbled, I did one finger at a time, but this time I did two-three fingers at a time to conserve polish and go a bit faster, so each nail turned out a little different, which is kind of fun. Also pretty in the shade! These colors go really well together. I forgot how much I like water marbling, I should do it more often. It is kind of a pain (especially when you have your heart set on a polish that was just not meant for the technique) but turns out really fun. Hope you all like it! So freaking awesome! I love this look but not sure I want to do the cleanup I imagine it needs! But this is amazing! oh my gosh this is too gorgeous ! 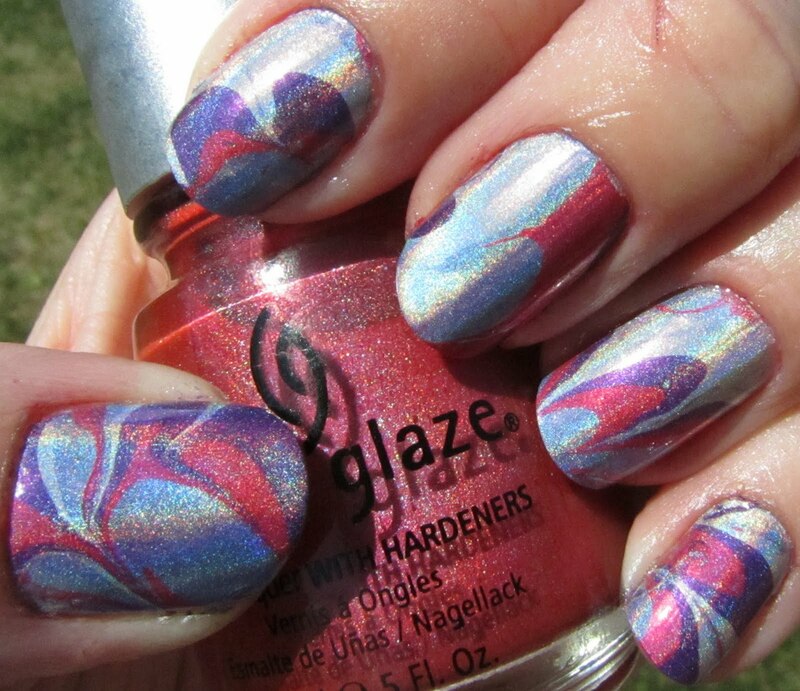 That's the coolest water marbling I've ever seen. Oh my goodness! I wouldn't be able to stop staring at that! This looks great!!! I have only done one holo water marble and I found it was a PITA to work with. Anyway...this is great! The last couple times I've tried to water marble, I couldn't get the polish to spread - I think it's the air conditioning. Weird. OMG! My mouth dropped! This looks amazing! Love the polishes you choose! This is stunning, amazing, gorgeous, etc etc. Great Job, I wouldn't be able to do this that well to save my life!! This is INSANELY pretty! 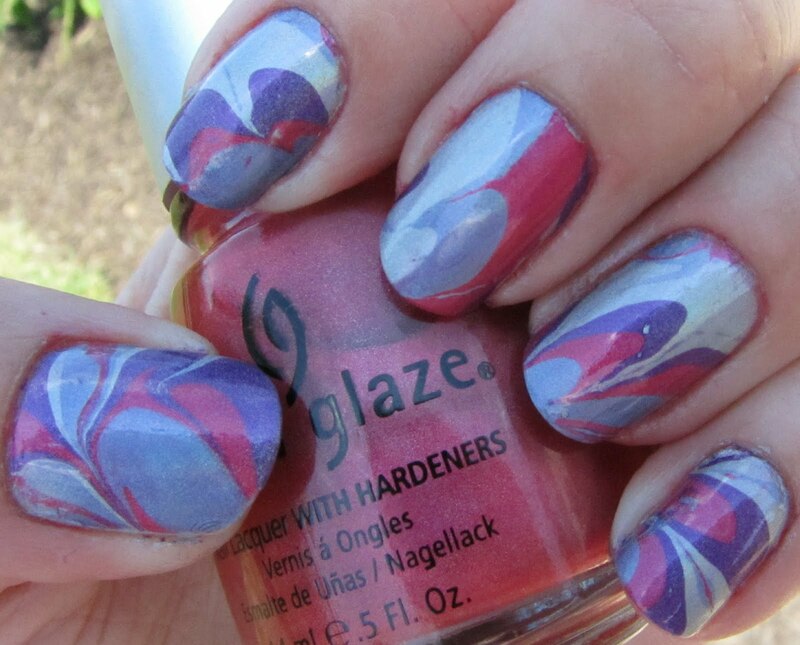 I'm going to try my first water marble soon. Do you find that certain types of polishes work better than others, or does it just vary for every individual polish? WHOOOOOAA :0 thats amazing! 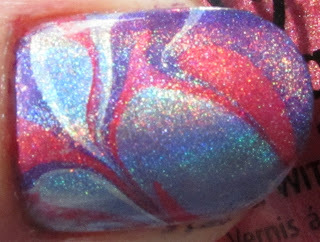 holo marble..!! This is a really pretty design! Could you provide a tutorial for this, they look really good!